Hello, friends. The Craft's Meow team is showing our previews for this month's release! There's lots happening, including two new Guest Designers this month: Sharri Seffens and Annette Allen, who both have made some beautiful projects for you all this week. We also have a new Free set with $50 purchase that we'll show in a few days. I have two sets being released (one goes with my Spellbinders' Licensed Design, Sewing Elements!). One is called Flower Garden and we're showcasing it today. It's a set that I've been wanting for a while now. As some of you know, as much as I love to color with my Copics, I don't always have the time to do so. That's when sets like Flower Garden come in handy.With several flowers, stems and leaves options, there are so many looks you can achieve with these images. For my card today, I used the flowers as a background image. I stamped them directly on the patterned paper (by Melissa Frances). 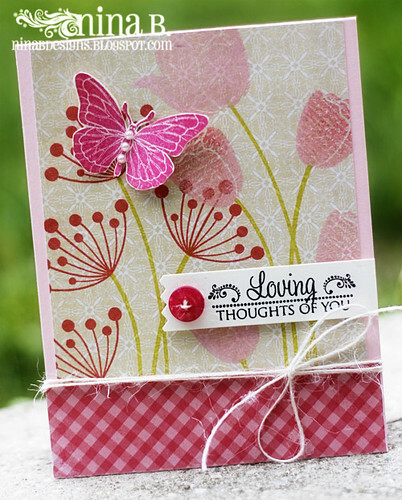 I then added a sentiment from Sent with Love and a butterfly from Beautiful Spring set. Please make sure you check out the TCM blog for more inspiration and giveaway info. Speaking of giveaways, make sure you check out the NinaB Designs blog hop where there are 5 prizes up for grabs. WOW...this is wonderful Nina...love the colors! 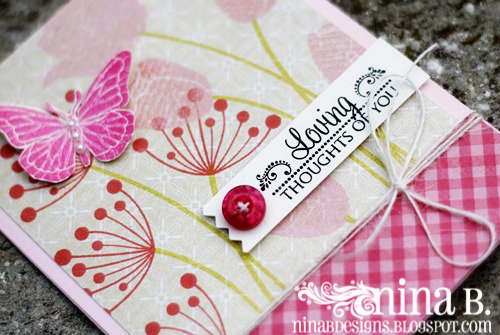 Beautiful card Nina...love the added butterfly..
Gorgeous colors, love the design and the new stamps! Love the contrast in your layers! so pretty! Oh the patterns with the flowers over stamped is just beautiful Nina!! I am VERY excited about this set!!!! Another great set Nina! I love the generational stamping on this card too. Creates such depth. Great work! This is gorgeous!! I love your card and the shapes and colors all paired together! Very nice summer card. New release looks beautiful. Thanks! Stunning ...as always. Thanks for the inspiration. The sweet butterfly is a nice touch. I like your color scheme---it's different. Amazing layering/use of color on this one. Wow. You gals are totally ROCK"N this set! This is sooooo pretty! LOVE how you stamped on the subtle patterned paper! LOVE this card! everything about it! awesome job with it. Lovly card as usual. the colors are so beautiful. the layers leave me inspired. Thank you for sharing. Very pretty card...love the dimension and texture you created. Gorgeous card with wonderful colors. Beautiful card, love your layers! Gorgeous card! I love the colour combo...and that butterfly is perfect. Beautiful card as always. I love you new stamp set. Pretty card. The flower stamp goes so well with the patterned background. Love the sentiment stamp. Preciosa, hermosos colores, te sigo para no perderme tu excelente trabajo, te dejo el mio por si quieres darte un paseo. Nina, Wow! Beautiful card! I love the flowers stamped on the pattern paper! I am in love with this set and am so excited that I have the opportunity to help preview and promote it! God has definitely blessed you with many gifts, Nina. 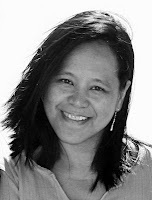 I'm so grateful that you share your lovely work with us. What a blessing!